I am often asked why I volunteer for a medical team when I’m not a medical person. Why would I want to spend vacation time in a hospital? It surprises me, not because I love being in hospitals (I actually don’t!) but because I love being with people and giving back to others. 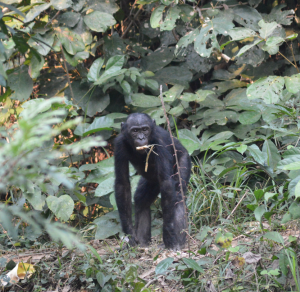 A adolescent Bonobo, one of the Great Apes, is watching the WOGO team watch him. I don’t volunteer for WOGO to vacation, I volunteer because I love working with the medical team and the patients and their families. Getting a hug from a patient after they’ve participated in group physical therapy is a great joy. Experiencing the smiles of families as they watch a patient take their first steps with a new knee is priceless. There is so much joy and celebration throughout all of the days we are onsite, it just fills you up. Faith in humanity is restored (to use a cliché). I wouldn’t miss our trips for anything. 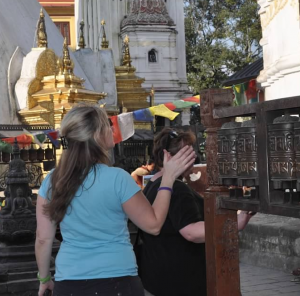 WOGO Surgeon Dr. Hakanson takes a prayer walk at the Monkey Temple in Kathmandu. I’ll admit that it is a lovely bonus that we have time to explore our locations during down time from surgery, recovery and physical therapy. The team has been lucky to experience the sights and sounds of Kathmandu, wandering the shops of the Thamel region. We’ve hiked volcanoes in Guatemala and tasted Macadamia nuts on a green farm outside of Antigua. We toured the Ngorongoro Crater in Tanzania and watched the incredible wildlife. In the Congo, we hiked into the jungle to see the Great Apes, the Bonobos. And in Cuba we soaked up everything the island nation had to offer. These are places I may never have seen. Experiencing them is a joy. But spending time with the medical team in action in a hospital is the real joy of a trip. There is always something to learn from my teammates. I can assist with patient care, I can hold a hand and I can cheer on a patient as they take their first steps. 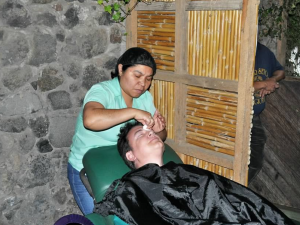 Dr. Dukes, WOGO anesthesiologist, gets the opportunity for a Macadamia nut facial in Guatemala. I also have the privilege of caring for our team. Making sure they have a nice place to stay, meals to eat and transportation to work each day. I have teammates who manage other critical areas of the trips and they are also not medical people by trade. We have our shipping lead, who takes care of getting our equipment to our site, and then home again. We have translators who come from all walks of life – from construction to nail technicians. We all contribute and help the team move forward. Giving back, that’s what it’s all about. Making life better for another. That just makes my day.